Flooding is always hard on a community, but when hospitals, mass transit, utilities, and others that impact the health and safety of residents are under water, these facilities may not be able to provide critical services or may even be forced to shut down. This leaves residents and businesses vulnerable to other threats and makes flood recovery ever more challenging. To combat these hazards, IISG and the Midwestern RegionalClimate Center (MRCC) have joined forces with the Cook County Department ofHomeland Security and Emergency Management to assess the vulnerability of critical facilities throughout Cook County and to work directly with building managers on adaptation steps that could reduce their risks in the face of future flooding events. The heart of the project is the Flood Vulnerability Assessment for Critical Facilities, which is an assessment tool. This set of questions will help Cook County managers determine a facility’s risk based on factors like its proximity to a flood plain, past flooding issues, stormwater drainage systems, and the location of key systems like back-up generators and computer servers. Facilities may also be able to use the tool to evaluate current emergency communication plans for heavy rainfall and determine whether improvements are necessary. After a pilot phase, the final assessment tool will be made available online for facilities beyond Cook County. What’s more, to help managers plan with an eye on the future, the project team will use historic rainfall data and climate forecasts to pinpoint the frequency of heavy storms now and predict how that rate may change as the climate does. 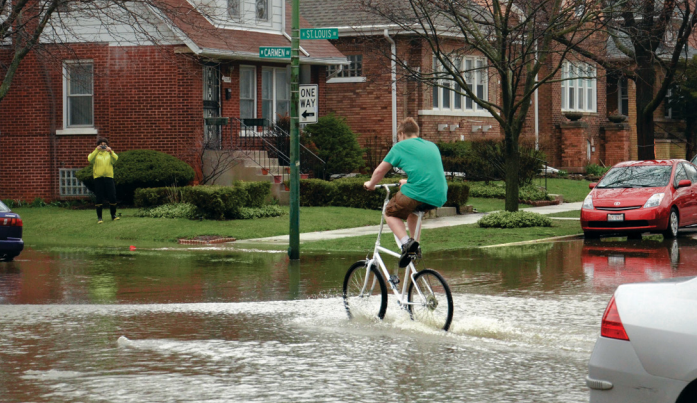 The Reducing Flooding Vulnerability of Chicago Critical Facilities project is led by Molly Woloszyn, IISG and MRCC extension climate specialist, and Beth Hall, MRCC director, with additional support from the Coordinated Hazard Assessment and Mapping Program at the Illinois StateWater Survey. Funding is provided through the National Sea Grant Office as part of the Community Climate Adaptation Initiative, which is focused on helping communities prepare for climate change.